Omaha native Vincent Hron has made his mark in the larger art world. The Bloomsburg University Professor returns to Omaha with his paintings of post-modern sublime, now on view at Anderson O’Brien Gallery in the Old Market. He brings with him a conceptually interesting and technically skilled body of work. The well tended corn growing to the right of the road in “Thunder Road” belies the order found in the sky above. The earth’s ground appears contained, in contrast with the ever expanding air circulating overhead. The image is paradoxically unified through its drama of difference. It is easy to imagine walking down this road, yet unsettling to wonder what those clouds might signify. In “Patronus” white contrails delineate the light of day. They swoop above the dark cloud which hovers close to the horizon. The Patronus charm in “Harry Potter” evoked a positive energy force when defending against dark Dementors. “The titles can seem silly,” Hron said. “They refer to what’s going on in everyday life. I was reading “Harry Potter” to my kids when I finished ‘Patronus;”. Silly or not, the title describes the action. The brush work itself is the charm in this stunning vista suspended above a country field. “Cloud Mountain” simultaneously curls and unfurls light and dark vapor. The compelling sensation of floating captures the imagination. “There is a transcendent dimension to this painting,” Hron said. “Probably because it is the only painting with no reference to the ground below, you can lose your bearings looking at it.” It is challenging not to look at it. The painting is intriguing with its complexity of forms. The point of view evokes the experience of looking out the window of an airplane in mid-flight. “Early in my career I was making paintings that were goofy and self-conscious,” he said. “As I kept working there was a shift to a more sincere kind of expression, a more naturalistic way of handling. I looked to the Hudson River School of painting, Thomas Cole and Frederic Church, using some of that vocabulary in a different context. “Brain Child”, with its repetition of forms and accumulation of variable sized curves, creates the spatial distortion Hron describes. The concave bowl of blue sky holds the white and gray froth of whipped fractals. It creates a sweeping motion. “This cloud has a little cloud popping out of its head,” Hron said. This central cloud does appear mythological, bringing to mind Zeus the god of sky and thunder in Greek mythology. The historical underpinning of Hron’s painterly investigation of rural vistas, placed in the context of contemporary life, provides each painting with its own unique narrative. The title for “Thunder Road” was inspired by Bruce Springsteen’s song of the same name. This song came to mind for a plumber, who commented on the painting when he was in Hron’s studio fixing a faucet. This non-traditional approach to the sublime, such as this happenstance title, opens many possibilities for any interpretation of meaning. “People do make meaning out of things in their own way,” Hron said. Standing in the middle of Anderson O’Brien’s large room, looking at each of the large paintings from a distance, creates a bodily sensation of space and motion. Each painting delivers an illuminating optical experience when viewed from a distance and then close up. This exhibition provides the discerning art viewer a rare opportunity to experience the evolution of an exceptional artist’s work in mid-career. 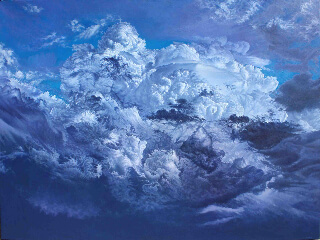 Vincent Hron continues through May 27, 2012 at Anderson O’Brien Fine Art in the Old Market, 1108 Jackson Street, Mon-Fri 10 am – 5:30 pm, Sat 10 am – 5 pm, (402) 884-0911, gallery@aobfineart.com.